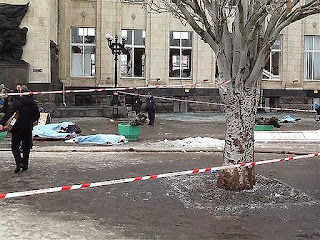 At least 16 people were killed in a blast at a railway station in the city of Volgograd, southern Russia. A suicide bomber is suspected to have carried out the attack, says the National Anti-terrorism Committee. 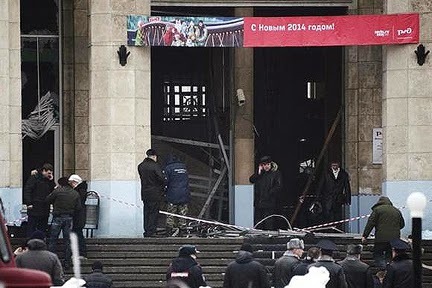 “According to verified information, the explosion at the railway station in Volgograd has claimed 16 lives," Russia's Investigative Committee said. Another 37 were injured, 8 of them more critically, including a girl of 9. The child has been taken to a local hospital. At the same time, the Health Ministry confirms that 45 people have been taken to hospital. The incident is being treated as an act of terrorism, the committee spokesman Vladimir Markin said. The blast took place at 12.45 local time inside the building of the railway. It is "thought to have been carried out by a female suicide bomber," according to the anti-terrorism committee's statement. 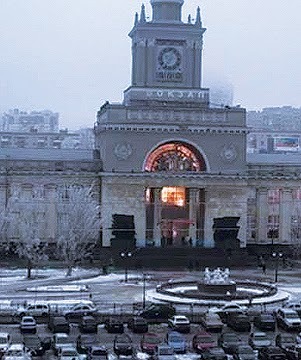 “At 12.45 we got informed that a boom or a blast was heard in the building of the railway station, Volgograd-1. Smoke was reported,” Svetlana Smolyaninova, a police spokesperson said, according to RIA Novosti. 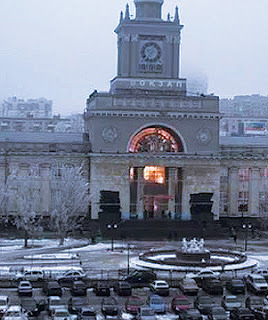 The power of the explosion at Volgograd’s station was equivalent to at least 10 kg TNT, according to Markin. The explosive device was stuffed with pieces of scrap metal. The Committee said that an undetonated F-1 grenade was also found at the scene. The Committee originally said a female suicide bomber detonated the bomb when she saw a police officer while approaching the metal detector. But since then the suicide bomber’s identity has been disputed. The female was initially identified as Oksana Aslanova, a close friend of Naida Asiyalova - also known as ‘Amaturahman’ - who was behind the October Volgograd attack. Aslanova is said to have been married twice to two militants, both eliminated earlier. A few hours later, more evidence emerged suggesting that a man could have also been involved in the attack. The version, which was also picked up by investigators, came after a male finger with a pin from a grenade was found at the scene. Given the new information, the possibility that the attack could have been carried out by both a man and a woman is not ruled out, Markin said. One witness told the news agency that he saw "two bodies lying in front of the entrance, pieces of shattered glass are everywhere, there's a ton of rubble there." He added that "apparently, the explosion led to a fire, which the firefighters quickly put out." 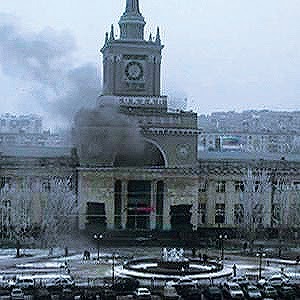 Another witness told RT that the windows on both levels of the station have been shattered and that "the police have cordoned off the area, nobody's allowed on the premises. There's a very heavy police presence, emergency ministry officials, bomb squads... it's understandable that people are afraid, but there aren't any screams or panicking." According to one of the accounts shared on a social network, people around the station thought a plane might have crashed because of the thick fog. President Vladimir Putin has ordered that all the necessary measures be taken to assist survivors and provide security in Volgograd, the Kremlin reported. 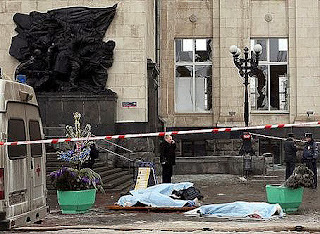 UN Security Council has condemned the Volgograd bombing “in the strongest terms” and registered its condolences for the victims and their families, the body’s official statement reads. Washington has also strongly condemned the terror attack in Volgograd. State Department spokeswoman Jen Psaki expressed condolences to the families of the victims and solidarity with the Russian people. US Ambassador to Russia Michael McFaul also expressed condolences. 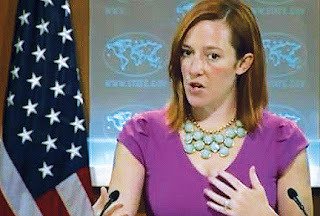 Lying White House whore Psaki expresses bogus "condolences"
Volgograd is a city of around 1 million people, about 690 km northeast of Sochi and close to Russia's volatile region of North Caucasus. The city saw a terrorist attack just in October, when a suicide bomber blew herself up in a bus, killing six people and injuring more than 30 others. 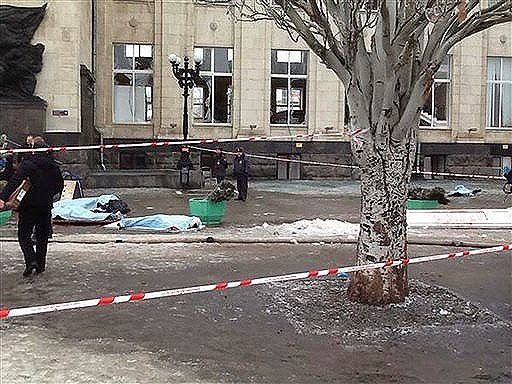 On Friday, a car bomb killed three people, all passerbys, in the southern Russian city of Pyatigorsk as a homemade explosive device went off outside the Road Traffic Safety Department. Funerals are scheduled for December 30.